Mother Nature doesn’t even bother knocking. 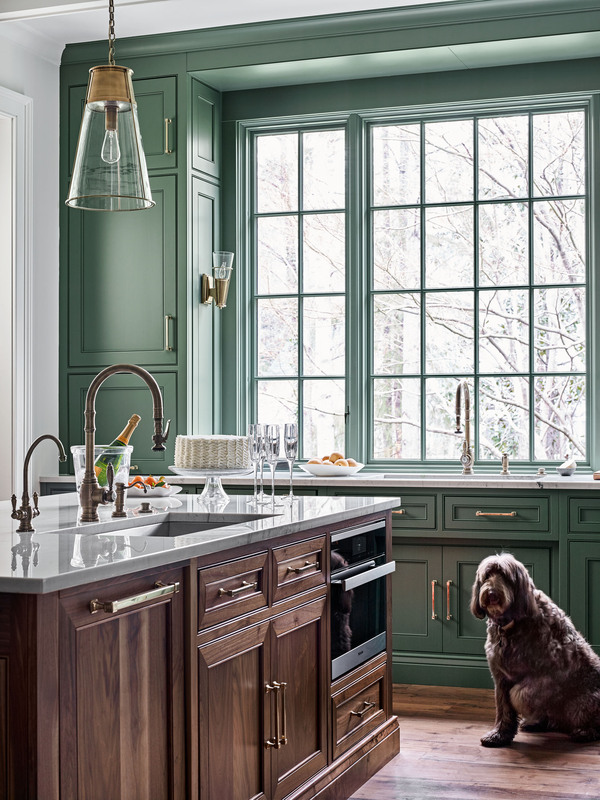 Her verdant greens come right in through the big kitchen window at Esti and Jeff Stein’s Atlanta home—and create somewhat of a color conundrum. Designer Bradley Odom of Dixon Rye saw the problem. Looking at the backyard nature-scape, he also saw the solution. “He said, ‘Let’s embrace the green,’ ” Esti recalls. 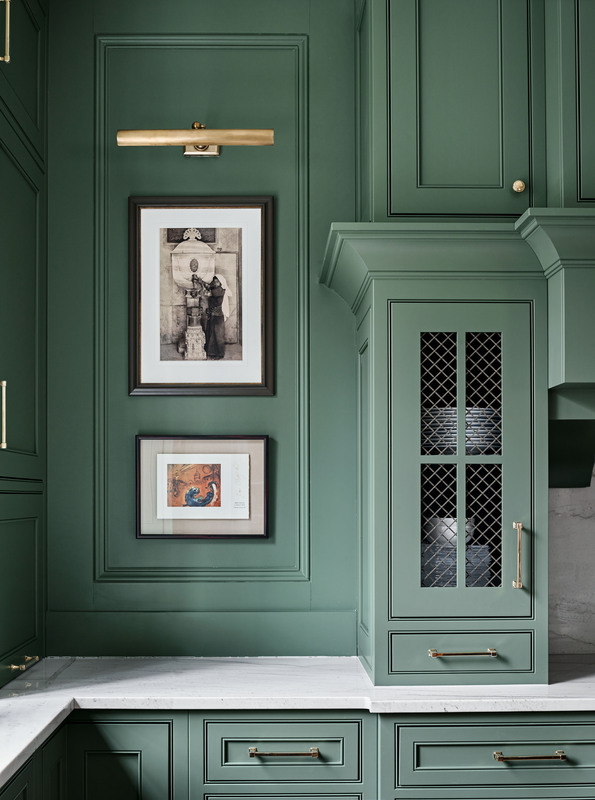 And so he did, coating cabinetry in Farrow & Ball’s “Green Smoke.” Quartz with the look of white marble, used for the backsplash and countertops, serves as a light, airy counterpoint to the deep green. A walnut island adds to the sophisticated mix, meshing with wide-plank walnut flooring. Unlacquered brass on hardware, lighting, and faucets finishes the room with subtle glimmer. Sinks in the island and in the window nook are among the kitchen’s kosher features. The thoughtful layout also provides Esti with separate zones for meat and dairy utensil storage and food preparation. While Esti cooks, she can keep an eye on the kids or engage with guests seated at the island or in the adjoining den. “It makes the kitchen feel like the center of our home,” she says. Interior designer: Bradley Odom, Dixon Rye, Atlanta; 404/883-3939; dixonrye.com. Builder: Rob Garrison, A Gotham Project, Atlanta; 404/557-8314. 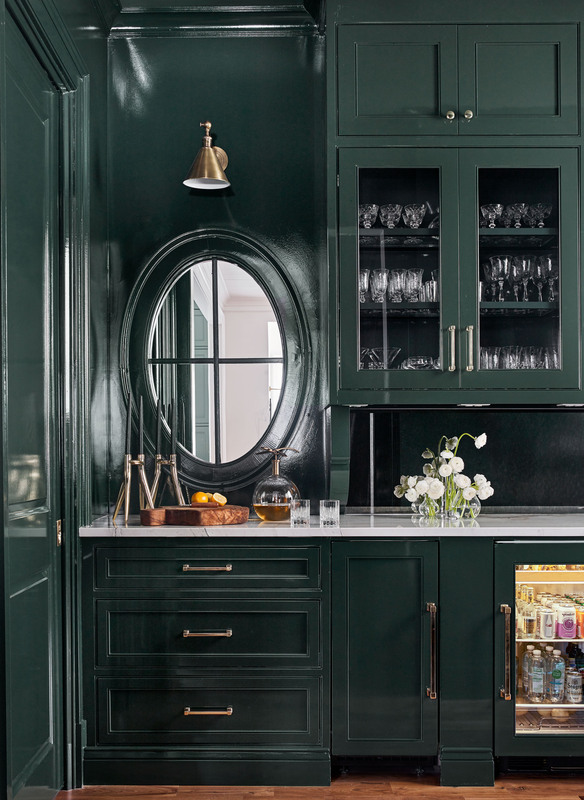 Kitchen paint “Green Smoke,” bar paint “Studio Green”: Farrow & Ball; us.farrow-ball.com. Kitchen and bar knobs A1146 from the Creations collection in polished brass, kitchen and bar pulls D985-12 from the Cube collection in polished brass: Alno; alnoinc.com. Countertops and backsplash “White Mountain Quartzite”: Walker Zanger; walkerzanger.com. Sinks “Strive”: Kohler; us.kohler.com. Perimeter faucet “Traditional Pulldown Faucet” in classic bronze, island faucet “Traditional Pulldown Faucet” in antique brass: Waterstone; waterstoneco.com. Dishwasher: Bosch; bosch.com. Refrigerator integrated with cabinetry: Sub-Zero; subzero-wolf.com. Range: Wolf; subzero-wolf.com. Oven in island: Miele; mieleusa.com. Pendant lighting over island “Robinson” in hand-rubbed antiqued brass, sconces flanking windows “Robinson Single Sconce,” both by Thomas O’Brien for Visual Comfort, 18” Cabinet Maker’s Picture Light, and Boston Functional Single Arm Library Light in butler’s pantry: Circa Lighting; circalighting.com. Barstools “Charlie Bar Stool” by Verellen: Dixon Rye; dixonrye.com.